Neobux – although a trusted and legit ptc website that has been paying its members for over 8 years – has some features that I really hate. Just to clarify, I am not ”anti-Neobux”, I will never say to someone not to join it. I just believe that one of the most successful ptc websites in the world has some really bad features (that need explanations) that literally f**k (sorry for the language) its members. So, in this post I decided to sum up all the features that I really hate about Neobux. I hope this post – with one way or another – reaches Neobux admin, in order to correct these flaws. Neobux is a trusted and paying ptc website for over 8 years. I am NOT affiliated with them because of the reasons you’ll see below. I understand though, that within the thousands of scam ptc websites that are out there, Neobux, is one of your best choices of joining a ptc website. So, after this small disclaimer, let’s jump straight to the things I hate about neobux. In order to upgrade your account fully on Neobux, you have to pay $980 per year. No, I am not Joking..
To reap all the benefits Neobux has to offer you need to upgrade your self to golden membership ($90) and then pay another $890 to upgrade your account to Ultimate. If you consider that Legit ptc websites, like Clixsense and BuxP, allow you to fully upgrade your account by paying on $17 and $49,99 consecutively, then their upgrade scheme is a total RIP OFF !! The ptc world has, eventually, opened its eyes about Rented Referrals. Rented Referrals are bots. It is an extra earning system that was created by ptc script providers to help ptc admins to make even more money in the cost of their members. Want some proof? Check the screenshot below taken from one of the ptc script maker’s website.. Rented Referrals are bots and I have a ton of proofs that prove it. Just read this article and you’ll understand. This fact alone makes me really angry. Neobux and any other ptc website that offer this ”scammy” method to earn money must be boycotted until they remove this feature from their system. Neobux shouldn’t use this method to scam its members just to earn more money. It is unethical and totally unacceptable – at leas from me. Note: Some people post proofs of their huge earnings from Neobux’s Rented Referral system. Just ask them what membership level they have. All of them are going to answer that have upgraded to Emerald membership and above. The reason is simple. It is a pyramid/ponzi scheme. The higher the membership you buy the more you earn. Why? Because Neobux literally distributes the money of free/standard members to its paid members (you know, the ones who pay $980 per year) in order to earn more and continue upgrading their memberships each year. There are literally hundreds of ”ex” Neobux users that have been banned from it, for telling their opinions or for criticising some of its features. NeoBux administrator tries to do everything he can to ”hide” the opinions and complaints of its members. Topics in the forum that try to expose things or simply are not the website’s best interest are deleted from the Forum as soon as they are created. Members who react are banned. In a nutshell, you can not say the truth inside Neobux’s Forum. Of course, the truth cannot be hidden from other Internet forums. Just look at these screenshot’s taken from different ptc related forums. Now, don’t get me wrong fellas but, I wouldn’t want to be in a situation where I would be in danger of getting banned from a website, after spending probably hundreds of hours promoting and building an income stream with it, just for speaking up my mind. The thing that drives me mad as hell with them is the Restrictions they have on Direct Referrals. Did you know that as a free member you aren’t allowed to have as many direct referrals as you can? So, how many direct referrals can you have in neobux then? Here’s the answer: This excerpt has been copied from a forum thread on Neobux. Depending on how many days you’ve been registered, all those days, minus the first 30, will count towards a limit increase. If a user registers with your username he/she won’t be your referral if you haven’t met the 30 days/100 clicks condition or have reached the limit of allowed direct referrals. You can always remove all direct referrals you don’t want to make room for new ones. Users can only have direct referrals after being a member for at least 30 days and having at least 100 clicks. Any attempts to get them before that will fail. What the F*** is going on here? Why are they doing this? Do they want to force us to rent their bots? Even if I pay almost $1000 in memberships, I would still have restrictions? How’s even possible for the small guy to grow he earnings when he has to overpass these restrictions? 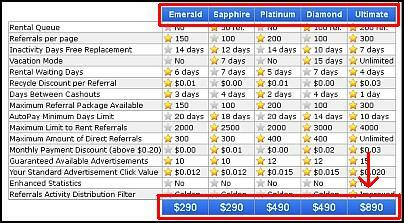 If you are on Neobux, you will never achieve the results, top affiliates on Clixsense are achieve. Look at this guy. He managed to acquire 8330 Active Referrals, in 6 months. Have you ever wondered why Neobux does not show how many amount of members it has? You own a ptc website and you need to attract more members. What’s better by showing your popularity? Well, Neobux has never revealed how many members it really has. Neobux supporters claim it has more than ten million members but we have never seen a single proof to justify there claims. Can someone explain this to me – and the rest of the community? Why does Neobux does not show how many members it has? This situation ”smells funny” to me and I’m sure that something NON-ETHICAL is hiding behind it ! Now this comes to complete my previous statement. 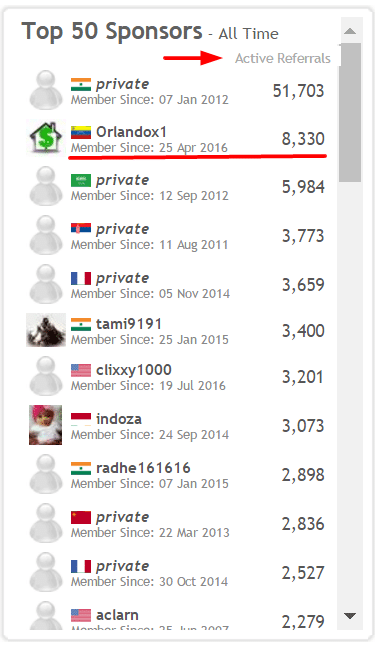 Neobux does not show how many members it has, but shows FAKE STATS at the bottom of it’s website. Screenshot taken on 26th of October 2016. Why does Neobux supposedly shows us how many members registered yesterday, but does not show the total of members? Let me tell you why. ITS FAKE ! Just do the maths guys. If a ptc website gets 15 000 members a day, every day, then, at the end of the year they would have 5 470 000 members. (365X15 000). So, in 8 years of running this website, they would have about 40 000 000 members? Wouldn’t you be proud to show case this number to potential members? Of course you would. SO, Neobux why do you lie to us? PTC Investigation is one of the most legit PTC review websites on the internet. The guys behind ptc investigation are professionals in exposing scam, unethical or scam-to-be, ptc websites. It is one of the most trusted ptc review site with thousands of loyal readers. If ptc investigation says something bad about a ptc site, then, you have to be really scared.. This is the case with Neobux. PTC-Investigation created a specific page that exposes the Unethical face of Neobux. The fact that ptc-investigation has a page that ”digs-a-grave” for neobux makes me stressful enough to stay away from it for good. Guys, if you are thinking on joining Neobux, then please take into great consideration these 7 facts that I’ve posted above. Neobux, pays ! It is paying of 8 years. If you would like to earn money by clicking ads and stuff, then by all means, join. But if you want to earn big money as an affiliate, then, stay away. Share this article with your friends. Help to spread the word if you think is useful. Agreeing with whatever you said except that their stats of 15000 members is fake. 15000 is not a big number when you have a lot of promoters promoting the site on blogs, youtube and even offline. 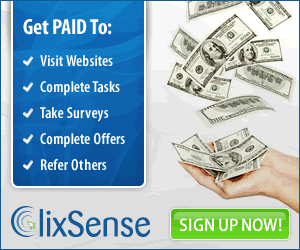 Your own promoted website, Clixsense, is having about 5 new members per minute, which adds upto about 10-15k of members per day which is almost same as that of Neobux. If Neobux membership rate is wrong, Clixsense membership rate should be wrong too, dude. Please correct the error on that part. The stats are real! Believe it or not. Thank you Alessandro. It’s good to see the content I produce helps people avoid scams.